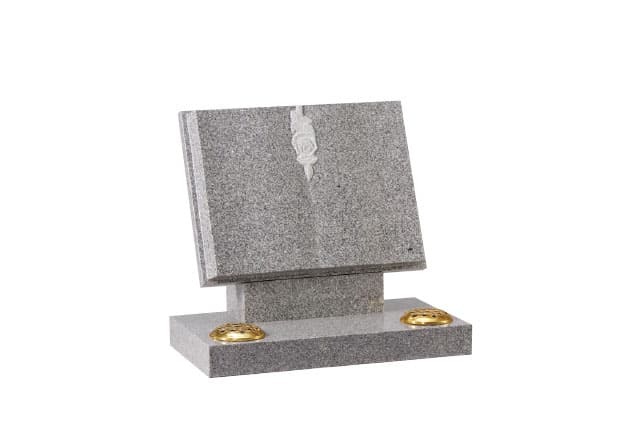 Our Book Memorials can be manufactured in any material and all ornaments and designs are interchangeable. Book available in 18”x 24”x 4” with a 3”x 27”x 15” base. Blue Pearl granite with a finely carved cord, tassel and shaped pages. Tablet available in 18”x 24”x 3” with a 3”x 27”x 15” base. Dark grey granite with hand carved and highlighted roses. Book available in 18”x 24”x 3” with a 3”x 27”x 15” base. 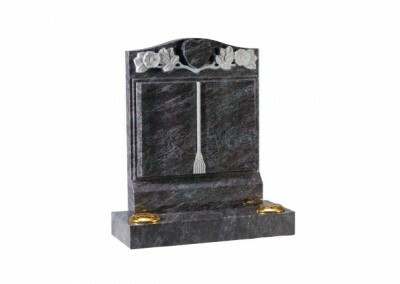 Black granite with carved cord and tassel pages. Book available in 18”x 24”x 3” with a 3”x 27”x 15” base. 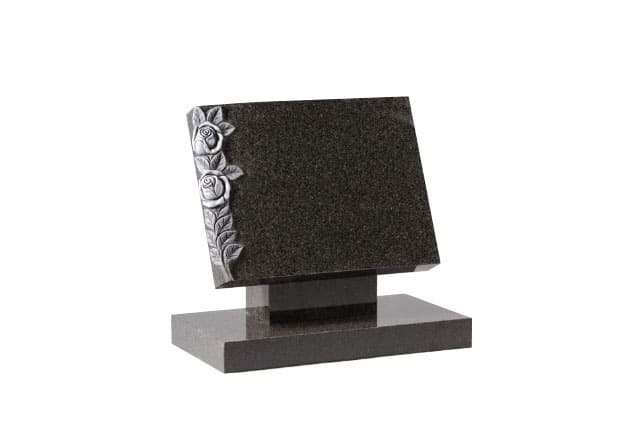 Lunar Grey granite with carved rose. Book available in 18”x 24”x 4” with a 4”x 27”x 15” base. 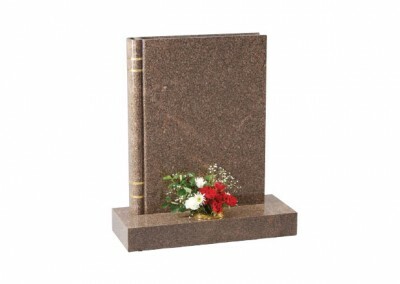 Black granite with stepped and polished page edges. Half ogee moulded edges on the base. 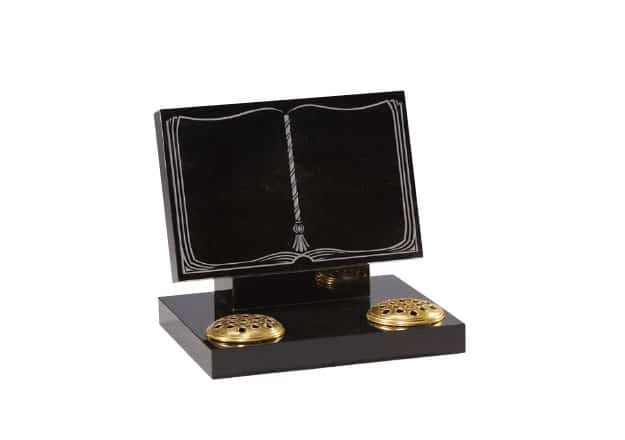 Book available in 12”x 18”x 2” with a 2”x 18”x 15” base. 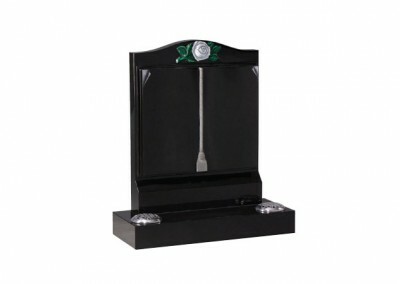 Black granite with economic mock bookset. 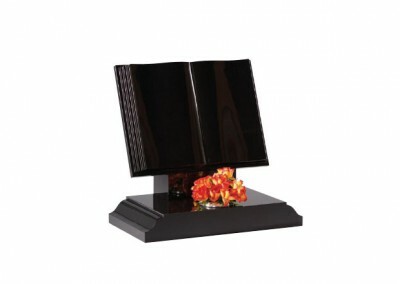 Book available in 30”x 28”x 6” with a 6”x 30”x 15” base. Black granite book with shaped back and front and centre splay base. Book available in 30”x 28”x 6” with a 6”x 30”x 15” base. 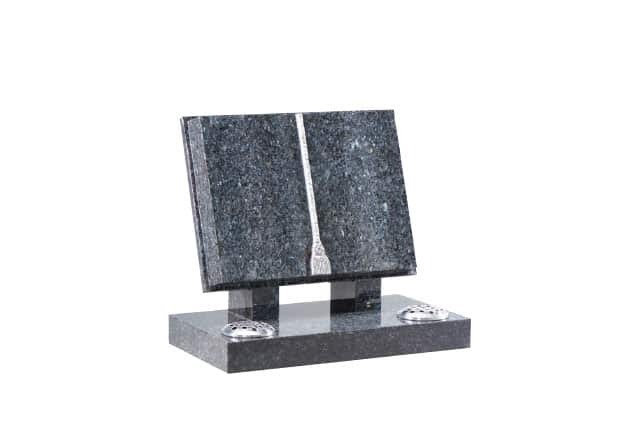 Bahama Blue granite with shaped back and front and centre splay base. Book available in 27”x 21”x 3” with a 3”x 24”x 12” base. Dark grey granite with embossed floral book design. 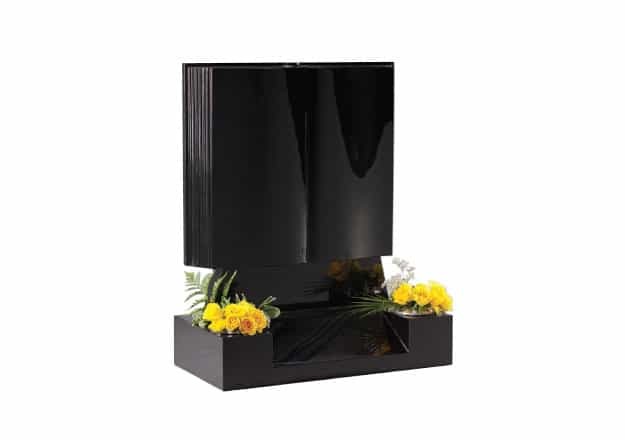 Book available in 30”x 24”x 4” with a 4”x 30”x 12” base. Yellow Teak granite with a fully worked representation of a ‘book of life’. 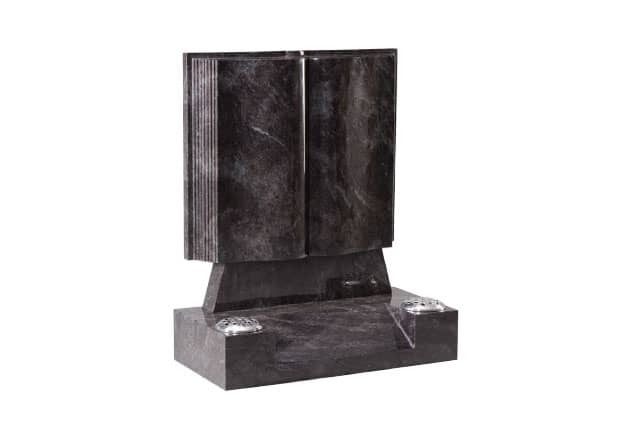 Book available in 30”x 24”x 3” with a 3”x 30”x 12” base. 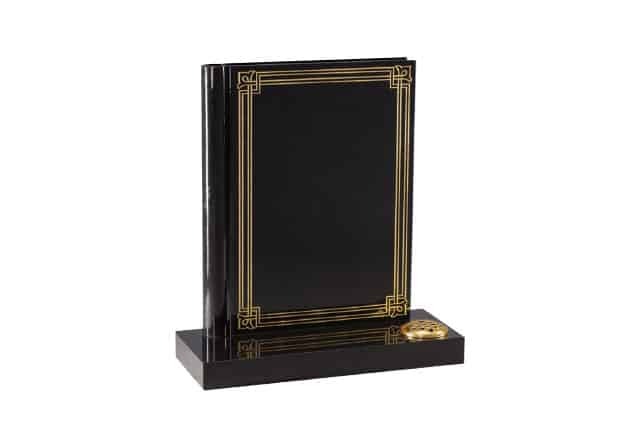 Black granite with ‘the book of life’ gilded decorative border. 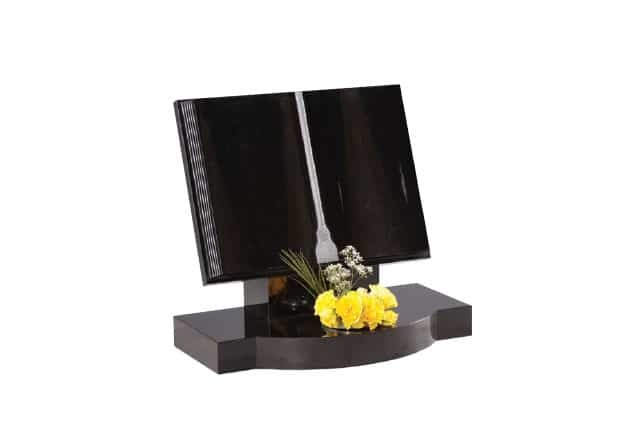 Book available in 30”x 24”x 4” with a 4”x 30”x 12” base. 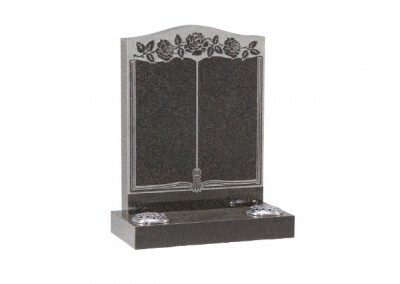 Bahama Blue granite with carved wild roses surround a heart. Book available in 30”x 24”x 4” with a 4”x 30”x 12” base. Black granite with carved roses and turned page feature. 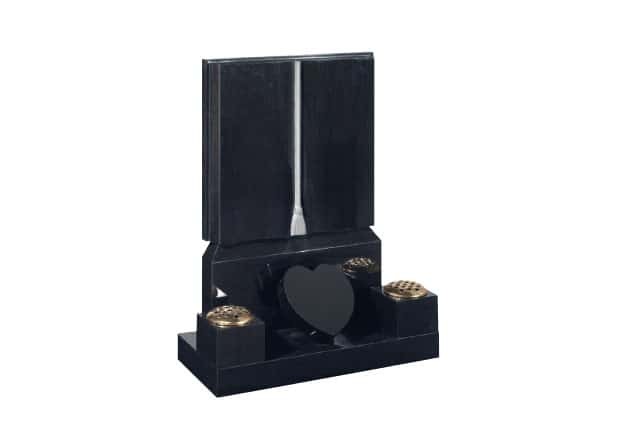 Book available in 33”x 24”x 3 with a 3”x 30”x 12” base, vases 4″ x 6″ x 6″ and 9″ x9″ x2″ heart. Black granite with carved cord and tassel engraving and heart token.